We have had the pleasure of getting to know Clive and Angela Jordan over the last few months, following their visit in September 2016 to the Garden Room Cafe at The Mansion. This lovely couple came to celebrate their golden wedding anniversary with their children, in the place where it all began 50 years ago. We are all hopeless romantics at Dine, so on hearing their story we wanted to do something really special for this couple and decided to recreate their wedding menu from 1966, with a Dine twist! On Friday 6th January, 18363 days after their original wedding day; Clive, Angela with their daughters and husbands visited us at The Mansion for an intimate dinner in the Barran Room. Owned by Leeds City Council for many years, The Mansion was previously leased out as a hotel and restaurant until its closure in 2004. Dine took over the lease in 2009, sympathetically restoring the venue to its former glory. We have been hosting weddings and celebrations at The Mansion since 2009. Both Clive and Angela were brought up in Leeds and met at Westminster Bank on Park Row where Clive was a cashier and Angela a ‘chatty’ customer. Clive bought the rings on the day of Winston Churchill’s funeral and the couple were officially engaged in the Easter of 1965, just ten days after they met. They married at The Immaculate Heart of Mary Church in Moortown, before holding their reception at the Mansion Hotel, as it was then. Clive’s career in banking subsequently took the couple all over the country but they came to live in Wetherby in 2005, sometime after Clive’s retirement. Recreations of the original wedding photographs taken on The Mansion’s grand staircase. Back in 1966 Clive and Angela’s wedding breakfast menu was cream of vegetable soup, followed by Aylesbury duck and apple sauce and stuffing with pomme Parisienne, creamed potatoes and garden peas. Dessert was Peach Melba. We recreated Clive and Angela’s wedding breakfast with a contemporary interpretation. Elements from the original menu were kept in all three courses; however more modern components were incorporated into the dishes. Vegetable soup was served as a starter alongside a shot glass of brunoise vegetables and olive ciabatta. The main course was duck breast with plum stuffing, chateaux potatoes, peas and heritage carrots with port and redcurrant jus. 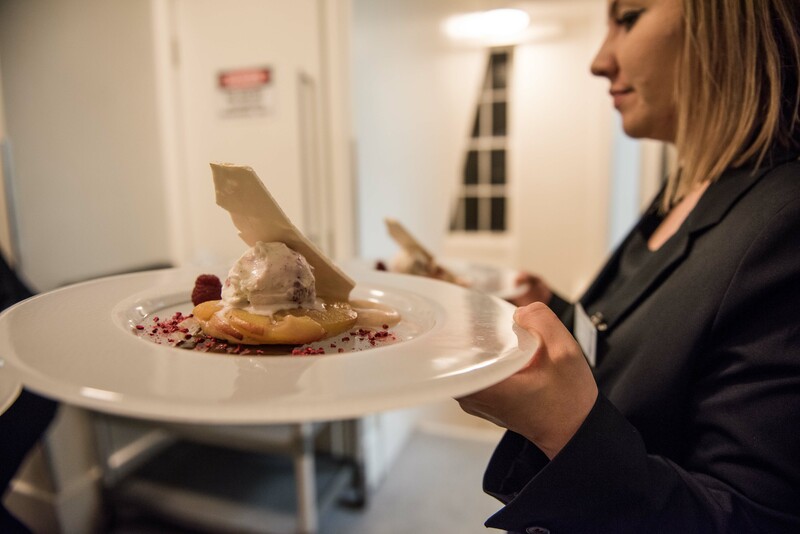 Peach tart tatin was combined with homemade raspberry ripple ice-cream, freeze dried raspberries, chocolate sauce, peach purée and a meringue shard to finish off the menu. Twisted Willow recreated Angela’s bouquet, incorporating red and yellow roses chosen for their wedding day.